Put resistance and resilience at the top of the agenda when you choose our 1×19 galvanised rope in this 2.5mm diameter setup. 2.5mm 1×19 Galvanised Wire Rope is endowed with an unpretentious design and made using the most durable materials around to bring you unbridled sturdiness in a slender frame. This example of the wire rope we produce is interesting for a number of reasons. Firstly the strand configuration is not especially complex, yet lends the rope the ability to suppress any stretching when under load and also boost its breaking force limits when compared with other galvanised rope. The next noteworthy asset is its rust-resistant galvanised coating. By adding a shield of zinc to the steel strands, corrosion caused by exposure to air and moisture will be minimised. The final thing to consider is which grade of rope you choose from this 2.5mm 1×19 line up. The strongest of the bunch can deliver a 656kg WLL in this diameter and strand configuration. Our modern manufacturing hardware and expertise allows us to both produce wire rope and also use it to build assemblies that are completely bespoke. That is why Rope Services Direct can provide a completely custom solution to any problem you might have. Give us a ring on 01384 78004 and let the RSD specialists talk to you about our products, services and customer perks. Send us an email from our site to get a similarly responsive support experience. 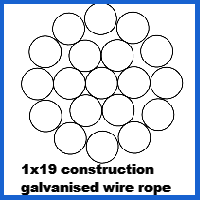 2.5mm 1x19 Galvanised Wire Rope Overall rating: 5 out of 5 based on 6 reviews.